Among the proposed changes is the widening of 62nd Avenue N at 25th Street. LEALMAN – Pinellas County has scheduled a neighborhood project information meeting tonight (April 17) to discuss planned intersection improvements at 62nd Avenue N and 25th Street N in Lealman. The proposed project consists of the widening of 62nd Avenue N for dedicated left turn lanes and future bike lanes, adding traffic signal mast arms, reconstructing existing sidewalks, and the milling and resurfacing of the existing roadway. 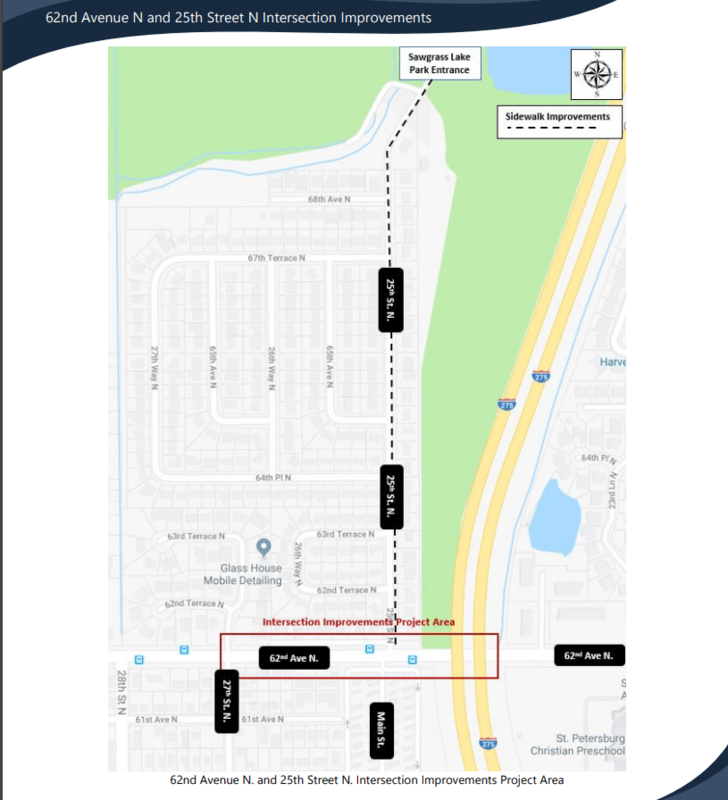 Other improvements include the design of an ADA-compliant sidewalk and curb ramps along the east side of 25th Street N from 62nd Avenue to the Sawgrass Lake Park entrance. The sidewalk and intersection improvements will enhance pedestrian, bicyclist and motorist safety and is being funded by Penny for Pinellas, the county’s local infrastructure sales tax. Construction is scheduled to begin in January or February and be complete in November or December 2020. The open house-style meeting will take place from 5:30 p.m. to 7:30 p.m. in the former cafeteria at the Lealman Exchange, 5175 45th St. N. The project team will display information and answer questions. All interested citizens are encouraged to attend. For information about the proposed project, go to pinellascounty.org. Map showing project area courtesy of Pinellas County.